Let me ask you this question, “can doing laundry change your mood?” My answer is “YES IT CAN”, and it can be changed for the better. In our house, Saturday is laundry day which is also my favorite weekend chore. 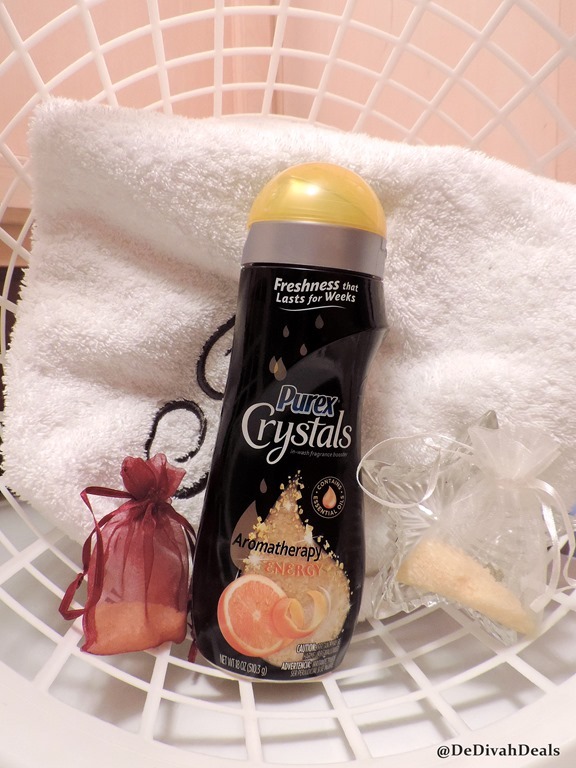 No, it’s not that I love washing, drying and folding clothes, it’s because of the fresh scent of the new Purex Crystals Aromatheraphy. These new Purex Crystals Aromatherapy in-wash scent boosters are blended with essential oils that turn a bore chore into so much more! The Purex Crystals Aromatherapy come in three long lasting fragrant scents, Energy, Well Being and Serenity, all mood enhancing aromas. The citrus scent of Energy is so fragrant that I’ve decided to use them in other rooms as a deodorizer and in sachets for my dresser drawers, check out this YouTube Video review to find out where else I’ll be using them. 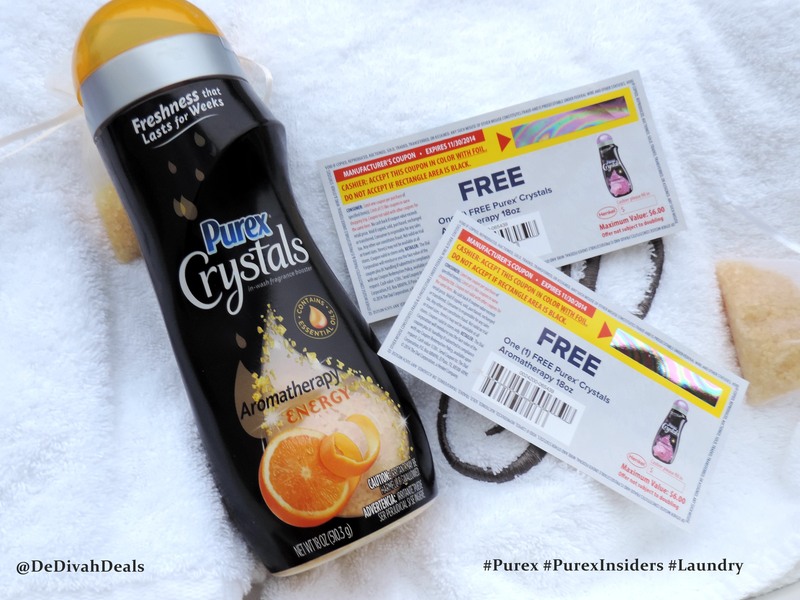 As much as I would love to give you all a FREE full size container of Purex Crystals Aromatherapy so that you can experience the bliss and spirit of these soothing aromas, only two will be chosen to receive a coupon for a FREE full size container. Good luck, now go back and check out my video! Of all the household chores, my favorite chore is washing clothes too. Cool, I knew there was another reason why I liked you! My favorite chore is changing the linens on the bed. I love fresh linens and these Purex Crystals will make them smell so good. oh yes, I think you would sleep like a newborn baby! How funny is that because I like to load the dishwasher as well and it’s my son’s job to unload and put them away! I love getting all the laundry done on the weekend! Nothing like seeing empty hampers and a full closet! Sounds good to me! Good luck with your Rafflecopter entry. I save my dusting for the weekend. I usually put scented dryer sheets under the couch and upholstered chair seats. I can put the crystals in little jewelry cloth bags and try that instead. Yes, I like using dryer sheets in my luggage, let me know if you like the new Purex Crystals and good luck in the Rafflecopter. My favorite weekend chore is gardening. I also enjoy using my steam mop. Em, I also love gardening because you are only concentrating on the task at hand, nothing else enters the mind. Good luck in the Rafflecopter. I enjoy doing laundry and cleaning the back yard. I only do laundry once a week, because it’s only my fiance and I but when I do laundry, I use the purex crystals, and they smell amazing!! Christina, aren’t they awesome? My sons started doing their own laundry around the age of 10 so it’s not so bad because like you, it’s just mine and hubby’s. Good luck with the Rafflecopter entry. I just got this the other day. It smells so delicious. Great review. Thanks, and good luck with the Rafflecopter! On Saturday, we all strip our bedding and I do laundry for our bedding. I love making sure our sheets and blankets smell and feel wonderful. Oh yes, freshly washed sheets brings back happy childhood memories for me. Good luck with the Rafflecopter entry and enjoy the weekend. I have never had a laundry day. Rather, whenever the laundry basket is full, the laundry gets done! Sounds like a plan to me! Enjoy the weekend. LJ, I understand completely, good luck with your Rafflecopter entry! I don’t mind sweeping and moping the kitchen on the weekends. Sarah, I used to enjoy mopping the kitchen floor but with tile and grout, they never seem to look clean, do you have any tips? My least favorite chore is a tie between folding laundry and cleaning toilets. Edna, that’s okay…most of the chores are our least favorites! Hope you are enjoying the week. I hate toilet cleaning as well but floors are my least favorite. Favorite choir, Laundry for sure! 🙂 Love the smell! Brenda, I find folding clothes therapeutic! Thanks and good luck with your Rafflecopter entry. I love to do laundry, just tried the well being scent it smells amazing! Michelle, I am getting that scent next – thanks! Good luck with the Rafflecopter entry.